Burton signed a contract with Houston on Wednesday, Aaron Wilson of the Houston Chronicle reports. Analysis: Burton's place on the 53-man roster comes following the release of tackle David Sharpe. 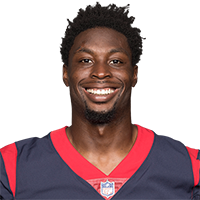 The second-year cornerback will provide the Texans with secondary depth, and is expected to play most of his snaps on special teams. Burton was waived by the Packers on Wednesday, according to the team's official site. Analysis: Burton was cut in order to make room for running back Aaron Jones, who was activated from exempt status. Burton was claimed off waivers from the Falcons on Sept. 11 and was inactive for Green Bay's Week 2 game against the Vikings. Burton was claimed off waivers by the Packers on Tuesday, Adam Schefter of ESPN reports. Analysis: Burton spent his rookie season on the Falcons' practice squad and made his NFL debut in their Week 1 loss to the Eagles. They waived him Monday but were likely hoping he would go unclaimed and land back on their 10-man practice unit. However, the Packers were quick to scoop him up, and he now figures to provide cornerback depth and special teams help in Green Bay. Burton was waived by the Falcons on Monday, Will McFadden of the team's official site reports. Analysis: A 2017 undrafted free agent, Burton has spent his entire professional career with the Falcons, with exception to Week 1's matchup against the Eagles wherein he made his NFL debut. Atlanta will hope for Burton to go unclaimed on waivers so he can be re-signed to the team's practice squad. Burton was called up from Atlanta's practice squad on Tuesday to fill the 53rd and final spot on the team's active roster, Will McFadden of the Falcons' official site reports. 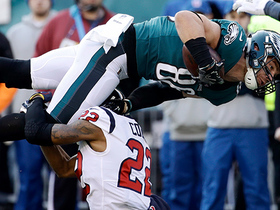 Philadelphia Eagles tight end Zach Ertz passes former Dallas Cowboys tight end Jason Witten for most catches in a season by a tight end.